As the international community marks the first-ever official World Braille Day on January 4, the United Nations (UN) has estimated that about 39 million people are blind globally, while another 1.3 billion people live with some form of near vision impairment. January 4 was proclaimed by the General Assembly in November last year, as a means of realising fully the human rights of visually-impaired and partially-sighted people. It is also a means of bringing written language to the forefront as a critical prerequisite for promoting fundamental freedoms. 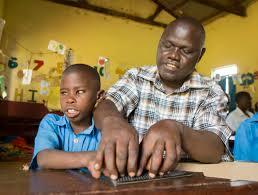 According to the National Union of Disabled Persons in Uganda, the number of blind people in the country has shot up to one million from 700,000 people in 2008; with Rwenzori region having the highest number of blind persons. Cataracts are said to be the leading cause of blindness in this East African country.